Flooding and water damage can happen to anyone. It could be a bad thunderstorm, a pipe bursting, or a tsunami and it can be pretty hard to recover from such an experience. Many things can cause water damage and there are plenty of ways to fix it, the things that follow can be just as stressful. Those that don’t take mold into consideration may find themselves having to spend a lot more money. Mold remediation can cost a pretty penny, but there are mold experts that can inspect and tell you exactly where and what kind of remediation you need. With their assistance, it can be a quick and easy process. There are many types of mold. However, there are only five common ones in found in the household. These can make people quite sick, so knowing how to get rid of it can help. Mold is a fungus that can release spores into the air. There are hundreds of types of mold, but there are only a few that are toxic to humans. There are certain molds that release mycotoxins that can infest the air and cause people to suffer from fatigue, nausea, digestive problems, breathing problems, and many other things. People who are sensitive to mold can suffer more greatly than others, and there have even been reports of death from these molds. If someone is suffering from any of these symptoms on a regular basis, a mold inspection might be the best option. Doctors tend to have a difficult time diagnosing mycotoxin infestation, so if they’re ever unsure, it just might be mold. There are many ways to get rid of mold, but one has to remove the entire cluster. If even a little bit of mold remains, it will regrow and spread again. A form of defense against this regrowth, however, is negative air containment or negative room pressure. What is negative room pressure? Used by many hospitals, negative room pressure is an isolation technique that prevents contamination. 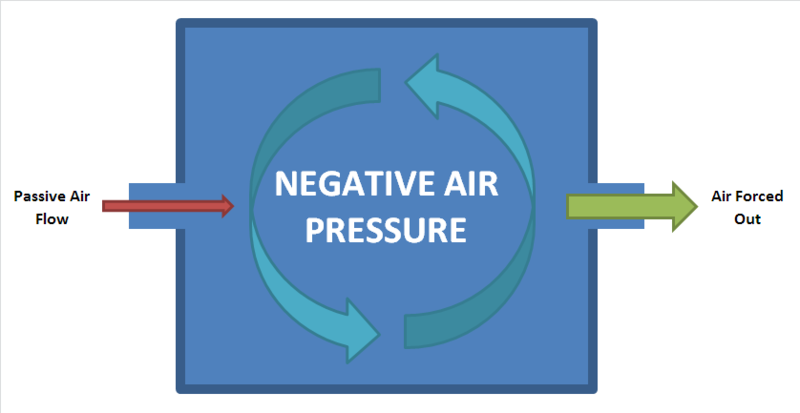 Negative pressure, which is basically a vacuum, is generated by a ventilation system. This system is maintained by taking more air out of the room than allowed inside of it. This, of course, requires the room to be sealed tight with no air leakage. With this negative room pressure, hospitals keep contagious diseases like chickenpox, tuberculosis, and worse. Since hospitals have connecting rooms, these mechanisms help keep them isolated. At the same time, this is a great way to keep your room clean from mold again. With these mechanisms, after mold has been removed, it will purify your air of the spores and mycotoxins that may remain. Can you make negative air pressure in your home? The short answer is yes, but it can take a bit of work. As said above, creating negative air pressure can only work if you have an air-tight seal around everything. When it comes to mold remediation, this is a requirement to purify the air. While hospitals may have them built in, one needs a negative air machine to circulate the air at home. Through sealing a room and doing various tests, you can do enough to keep the air purified enough to clean mold from anywhere. It’s a practical use of mold remediation and any other disease that may go through the air. This method is good for things like asbestos, keeping viruses from contaminating rooms, and more. Negative air pressure and negative room pressure are paramount when it comes to mold remediation. Hospitals use these techniques to isolate patient and ER rooms to prevent cross-contamination, especially for contagious diseases. Mold can be treated the same way after being cleaned. In order to fully remove mold from a home, you must get rid of all the spores. With negative air machines and sealing off rooms, you can purify the air and get the mold spores out of your home. This can also help with other airborne problems like dust, humidity, and other allergens. Filtering out all of this air can make things easier, especially if one is sensitive to them or those that suffer from asthma. There are mold experts that can help you, so don't be afraid to seek them out.